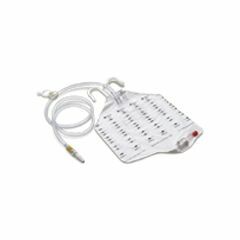 The Hollister Bedside Drainage Collector with Anti-Reflux Valve is a convenient, large volume (2000ml) collector that can be used with most conduction devices in either the hospital or the home. It's easy to use and secures to the bed rails by integral bed hangers. The easy to use drain valve requires minimal dexterity. The Bedside Drainage Collector safely and securely attaches to most conduction devices and non-reflux valve and drip chamber eliminates urine migration. Drain Valve: A valve that permits the user to empty the pouch or leg bag without getting fingers wet. Sample Port: A conveniently located injection site that allows a sample to be obtained for diagnostic purposes. Bed sheet Clip: A convenient integral plastic clip that is used to securely fasten the collector's tubing to the bed linens and thereby preventing the tubing from twisting and interrupting the fluid pathway. Anti-Reflux Valve: One way flow valve integral to the construction of a sheath or pouch that prevents flow back toward the skin. Attached Bed Hangers: Convenient hooks are integral to the collector for hanging it on bed rails. Calibration Markings: Convenient gradations allow the care giver to estimate the volume of fluid in the collector. Sterile Fluid Pathway Packaging: Increases the convenience of the leg bag; The leg bag can be removed from its package in any setting and connected to an indwelling catheter, for example, without requiring a sterile field. Sturdy. Safe. Easy Storage. Lightweight. Item needs a quick release valve and some kind of eaiser type of pressure release, you can't put liquid in without letting air out. Very good product and very easy to use. I feel very safe at night with this bag. Very sturdy and easy to use. Only negative -- the drain hose/clamp method could be improved. Hard to get closed sometimes and very slow drainage. I use as a night collection and has made my night a lot better and more rest. Hollister over all is a great product the flow to the bag has no back wash and even with the tube bent still flows very well. What does FR stand for? French; it is 1/3 of a millimiter in diameter.